I started this review of Marchesa Parfum d'Extase (launched last year in September) three times already and have erased it again and again. You see, I've been boring myself, which is never a good sign. Even an alternate reality fantasy in which I'm George Clooney's companion for this year's award show season didn't work. Yes, there's a Marchesa gown involved, and of course, George himself. But none of it worked for me. Kind of like Parfum d'Extase, I guess. 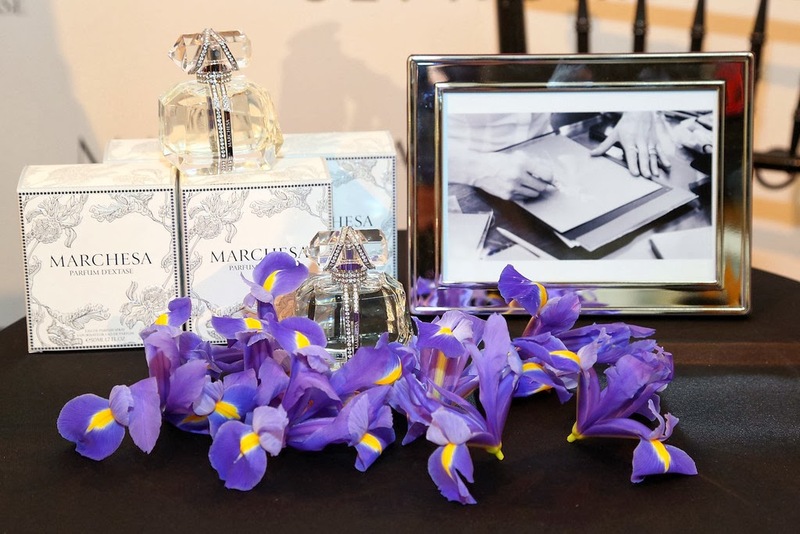 A Marchesa perfume makes sense. The brand is almost an household name by now, at least in households that watch red carpet arrivals and Project Runway All Stars. Georgina Chapman, one of Marchesa's founders (the other one is Keren Craig) is one of the judges on PRAS. It drives me crazy, by the way, that Chapman's "title" whenever she's presented there is "the beautiful Georgina Chapman". We all have eyes. We can tell that she's a very attractive woman. She has some much more impressive accomplishments, though. We should be thankful they don't list her marriage to Harvey Weinstein as one of them. Back to Parfum d'Extase, a fragrance composed by Annie Buzantian of Puredistance fame (Puredistance I, Antonia, and Opardu, but also have a look at her more commercial creations as listed on Fragrantica). Ms. Buzantian is an expert on "pretty" and this is exactly what she did for Marchesa. Parfum d'Extase is a fresh and feminine green(ish) floral that serves you a huge bouquet of delicate flowers all in pale hues of purple, pink and white. There's absolutely no naughtiness hidden among the soft petals. The iris note while dominant is so infused with water and freesia it's almost sheer. Parfum d'Extase is perfect and a little frozen in time, and just like Angela remarked on Now Smell This, would probably have a major appeal for brides in lieu of a Marchesa gown. I can't say that Parfum d'Extase doesn't have any base notes. It does. There's an element of warmth there and I really like sticking my face down my shirt and breathing in whatever's left of it after four or five hours. But the initial floral blast, as pretty as it is, gives me a piercing headache with a side of nausea (a very very rare occurrence for me). Parfum d'Extase smells nicer (and even more interesting) on fabric than on my skin, so I think any other samples of it that cross my path will be best used in the coat closet. The whole pristine feel of the perfume is more of a something that smells good, but doesn't register with me as a personal fragrance. 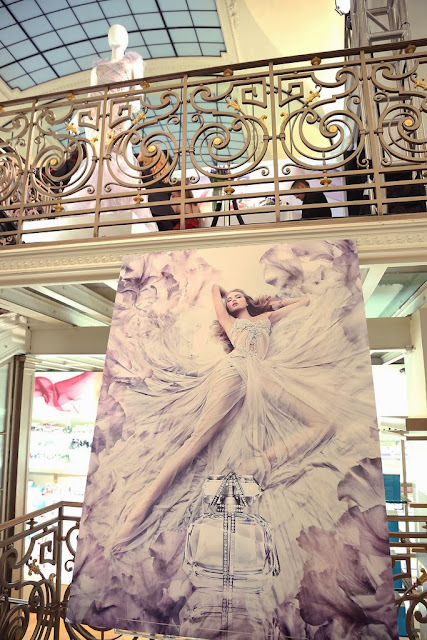 It makes sense that Marchesa also offers Parfum d'Extase as hair mist. It'd be like using a million dollar shampoo. Notes: iris flower, star anise, blackcurrant, violet leaves, lotus flower, night blooming jasmine, Bulgarian rose water, orange blossom, iris root, ambrox and muscenone. Marchesa- Parfum d'Extase (starting at $10 for a 0.17 oz/5ml roller ball) is available at Sephora. Photos from Parfum d'Extase launch during 2012 Fashion's Night Out via Zimbio. the packaging is so pretty for it looks so elegant and classy. I find the scent interesting. I hope that I could get samples of it so that I get to smell first its scent before buying it out. I love pretty fragrances, but this one was so bad, I returned it...and I return nothing unless it's defective. I generally like Marchesa Parfum d'Extase; it doesn't have a strong character, but it's a nice smell for occasions that require a soft scent!